Yesterday marked the beginning of the Brooklyn Community Pride Center’s participation in the nationally-operated PowerOn program, which provides housing-insecure LGBTQ+ youth with the technology they need to access crucial online resources. 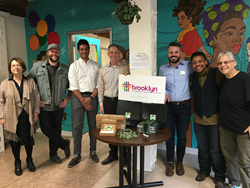 Yesterday marked the beginning of the Brooklyn Community Pride Center’s participation in the nationally-operated PowerOn program, which provides housing-insecure LGBTQ+ youth with the technology they need to access crucial online resources. PowerOn is donating 13 laptops, 25 portable power banks, and 25 USB drives to kick off the partnership with more donations to follow as needed. The donated devices will be distributed to individuals who complete programming as well as be housed in the Center for classes and other group use. PowerOn works nationally to upcycle lightly used donated technology from individuals and companies, beginning with a certified wipe of all devices, followed by complete refurbishment and distribution to homeless and housing-insecure LGBTQ+ youth through a network of partner LGBTQ+ community centers and homeless shelters. The Brooklyn Community Pride Center provides services and support to the Brooklyn’s LGBTQ+ community through original programming and organizational partnerships. With programming for participants of all ages, including the newly-launched Pride Path internship program for young adults, the Brooklyn Community Pride Center works to provide a safe and affirming space in which all members of the community can thrive. Each night as many as 1.6 million children and teens sleep on America’s streets. Over 40 percent, or 650,000, of these homeless youth identify as LGBTQ+, which is larger than the population of Baltimore. Many LGBTQ+ youth find themselves in homeless or housing-insecure situations after family conflicts over sexual orientation or gender identity. Technology is important for homeless and at-risk LGBTQ+ youth to stay connected with supportive networks and improve their personal safety. Phones and other devices often provide one of the only LGBTQ+ safe and affirming access points to the Internet. The Brooklyn Community Pride Center is PowerOn’s seventh fully operational partner location. Another 19 centers are expected to launch in 2018. Partnerships are an important part of PowerOn’s ability to expand rapidly after several years of exploring the value of technology for the youth it serves. PowerOn is operated by Straight But Not Narrow, human-I-T, The Trevor Project, and LGBT Technology Institute. If you have technology you would like to donate to the program please visit http://www.PowerOnLGBT.org.